The Horror Movie BBQ: Fall Flea Market Finds! This year has been a pretty crappy year for flea marketing. 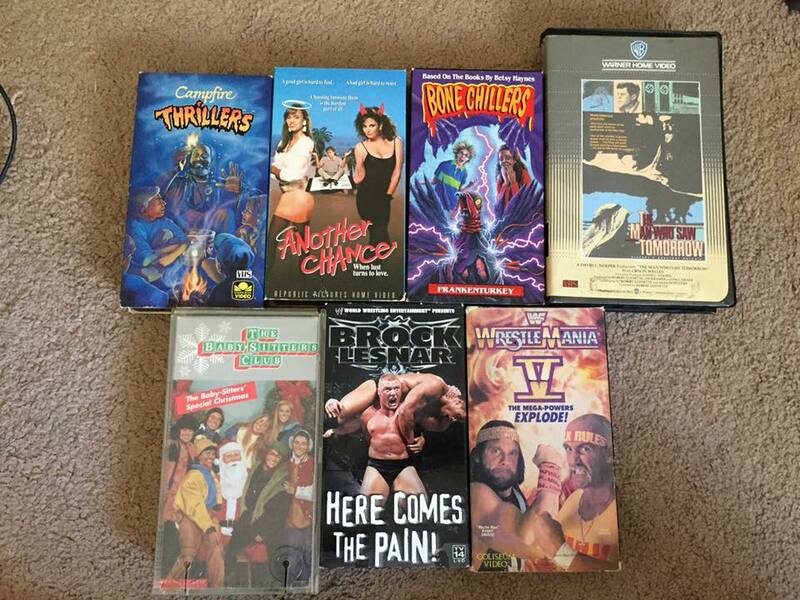 I don't know why but I can't say I've been to flea markets and walked out with gems. Seems like last year's adventures seemed to have been a giant peak period. A little disconcerting but I still kept at it. A dry spell started in July. But dry spells don't last forever. Thank goodness. This past Sunday, my friend Sean was in town and he was interested in heading to the flea market. I was more than happy to oblige. I wasn't expecting much but I figured it would be a fun time with him. Maybe I could find a new VHS or a He-Man figure missing an arm, but I wasn't expecting to walk out with a complete Boulder Hill from MASK. Perhaps low expectations worked in my favor after all. Maybe being beaten down by the flea market fates for so long finally humbled me to just accept finding a worn out copy of Sleepaway Camp 3 and be happy about it. Humbling indeed. But today was my day. 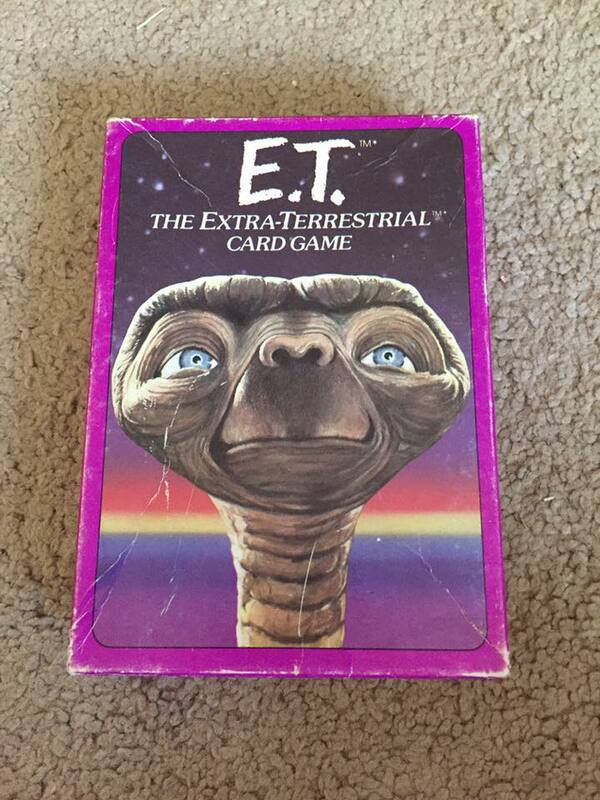 The ET card game was a real surprise to. It's not the most sought after piece of nostalgia but it's still a neat thing to pick up! I always enjoy finding stuff like this. 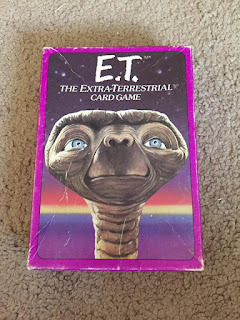 I love ET and any retro games, so how could I pass it up? I'm totally down for an afternoon of this and other corny card games! I'll order a pizza and you bring the Reeses Pieces! Trivia: The first date I went on in Middle School was to see Spice World with my high school girlfriend. Titanic was sold out. I can't tell if that was a good or bad thing. Because I sat through 90 minutes of that Spice-ploitation movie. 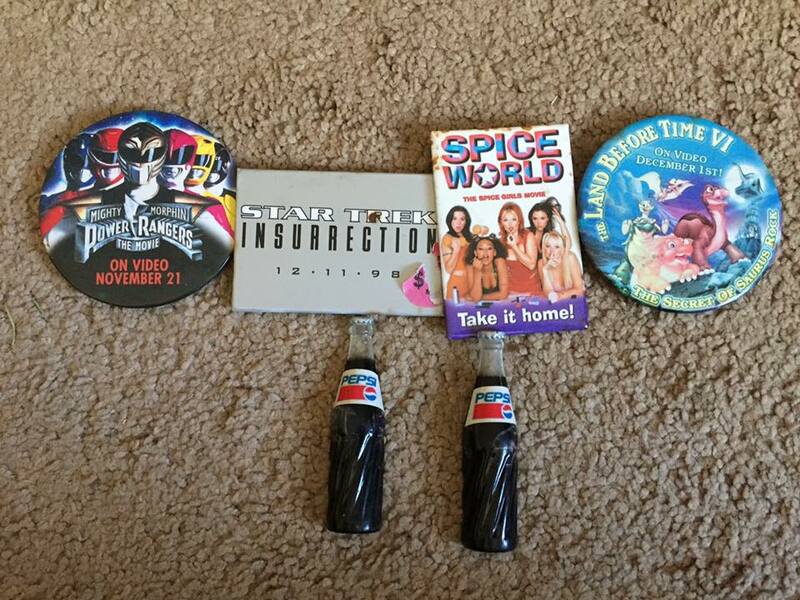 Power Rangers, Land Before Time and Star Trek are great and all, but the champs of this lot are the vintage Pepsi magnets. Owned in the Grandmothers everywhere in the 80s, these tiny replicas are a nice for magnet collectors such as myself. Plus, I'm a Pepsi guy so it's nice to add these to my fridge. Woo! Somewhat of a "comfort food" when it comes to flea markets. Any collector knows it's the ultimate goal to find as many rare or old action figures as possible. It's not really explainable but ask any flea market junkie what they need to find to feel satisfied, they'll most likely say action figures of their youth. Thankfully after this flea market trip, I feel satisfied to the point that I could start smoking cigarettes again. 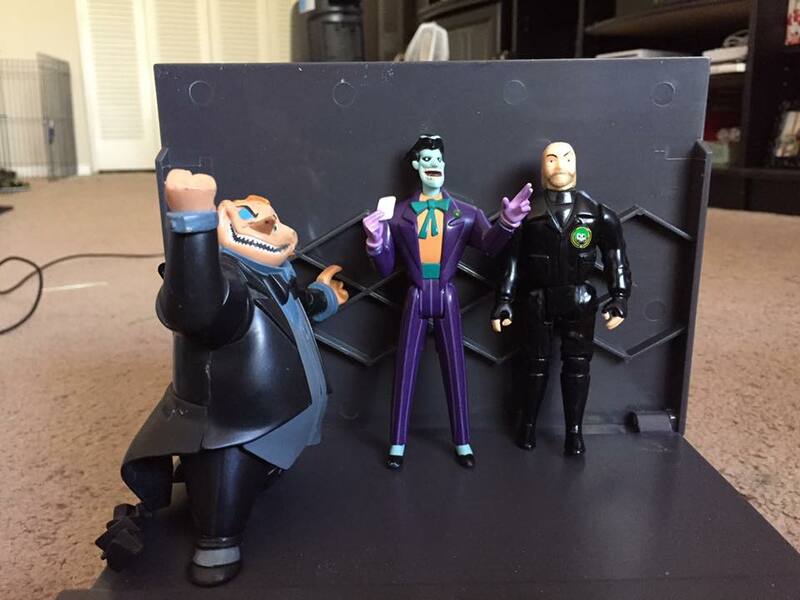 Two animated Batman figures, Batman Returns figure and a Michael Keaton Bruce Wayne. That's a lot of suits for Master Wayne, but I think he's covered for future missions and battles. Assuming that stylish purple turtleneck isn't enough to intimidate the worst Gotham has to offer. I mean, as great of a Keaton likeness as that is, he looks like he should be a member of Colour Me Badd. That shade of purple only really works for Batgirl. Also notice my bunny Charlie not letting Batman have all the fun and glory. Right after this photo was taken, he raced over and started licking these figures and refused to leave unless I gave him head-rubs. Bunny problems. I has them. A Batman Forever Robin and a Huntress from the DC Total Justice line. I must confess, I'm a big fan of Chris O Donnell as Robin. I thought he was a natural in the role, so this was a welcome addition. Any Batman movie universe figures are welcome. Well, except Batman and Robin. I actually left a Poison Ivy figure behind because I try to avoid that movie. Wasn't my favorite and until I revisit it, I don't think I want any part of it. 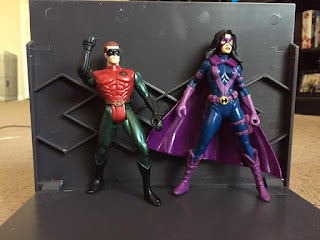 As far as the Huntress, I'm a lifelong fan of hers. I always found her to be a compelling character. And this is one of her best action figure representations from the Total Justice line, which was already an awesome line. Sadly, there haven't been nonstop releases of her like say a Supergirl or Zatanna, so a double win there. At the same time, this figure looks like she belongs in an episode of Gargoyles or something. She's just so 90's I can't take it much longer. More DC goodness! The Penguin is from the 2005 line The Batman which was perhaps the most bizarre interpretation of Batman yet. 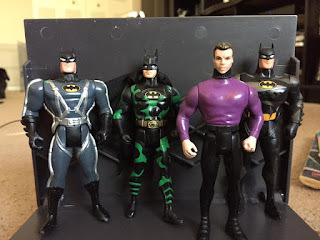 It was a fan favorite toy line and cartoon and offered some new wrinkles to the Batman lore. Good ol' Oswald here represents his fishy persona more than ever I mean, he's one step away from literally swimming and biting raw fish. Awesome. 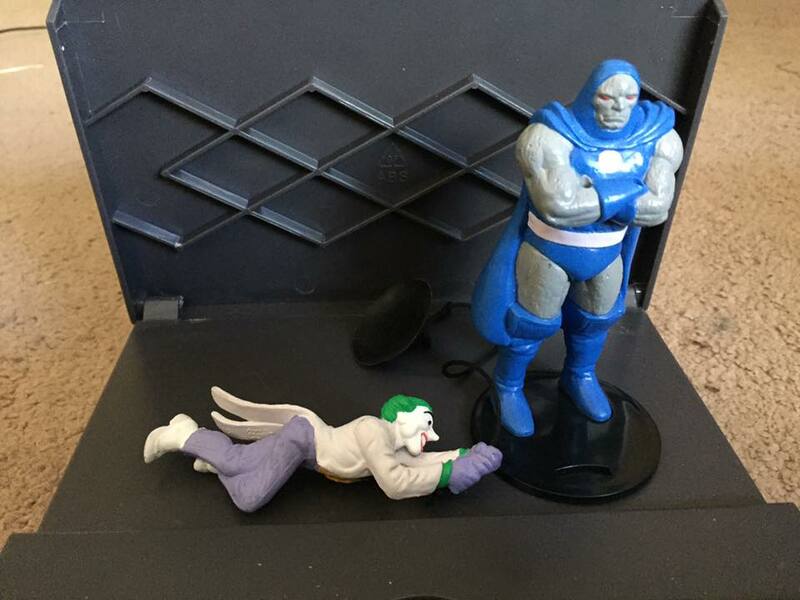 Up next is the Joker from 1998's New Adventures of Batman toy line. This has always been one of my favorite Joker figures. The pose, the card in his hand, the expression in his hand and the paint job. What a flawless Joker. I'd totally put him in my top 5 Joker's of all time. Love that Joker! Speaking of Joker, you can't have the Mistah J without his number one guy, Bob The Goon! Yes! 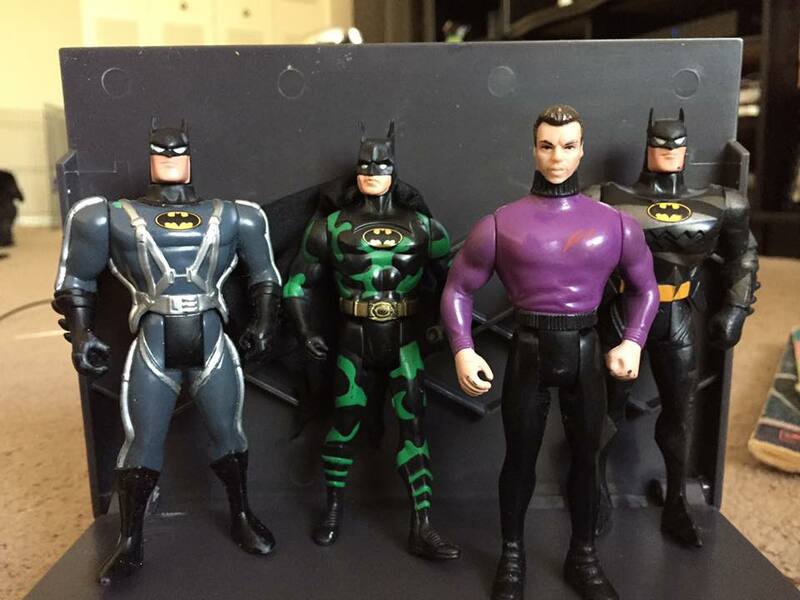 From the 1989 Toy Biz "Batman" line. I can't tell you how long I've been wanting one of these but never pulled the trigger. As cheap as that early Toy Biz line was, it still marks the only appearance of Bob. Not he's an amazing action figure by any means, in fact he resembles more of George Carlin on his worst day than anything, but seeing as how much I adore Batman 89, I simply had to have him. 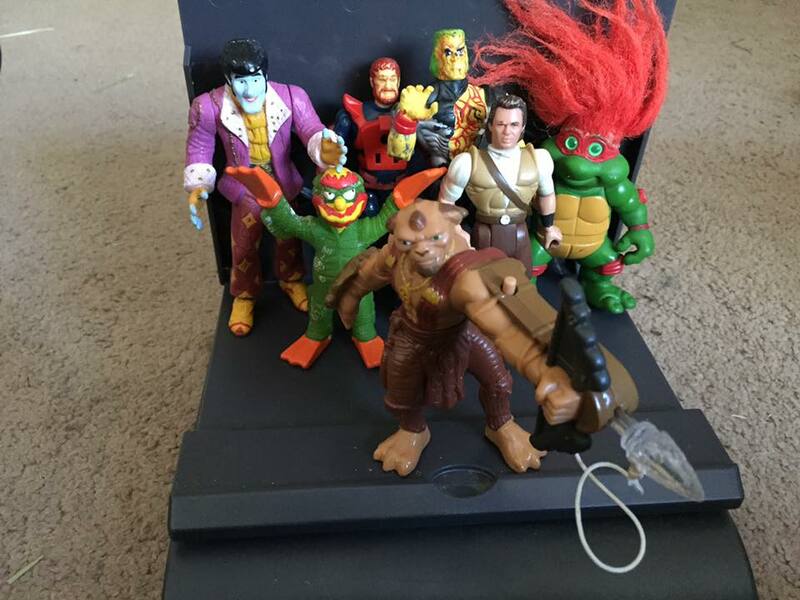 This potpourri of figures including figures from Small Soldiers, Robin Hood Prince of Thieves, Visionaries, X-Men, a Burger King Simpsons Halloween, Beetleborgs(FLABBER!) and a Ninja Turtle Troll Doll. A nice handful of collection padding pieces but nothing personally amazing. Although, Flabber was a favorite even back in 1997 and even became a long running joke between me and my friends. So, I don't consider this a bad find at all. Plus, who can't use a Creature from the Black Lagoon/Willie mashup? That may be my favorite of the lot. I'm sure it's a favorite of my buddy Thomas of ShitMovieFest, He loves him some Gillman. More Batman fun! A Joker suction cup figure that is somewhat reminiscent of his final scene in Batman 89(although, he was hanging from a helicopter rope ladder, let's not fight over petty semantics here) makes a fun figure for either hanging from my car window or the window in my office. He may be the villain in Batman, but he's a hero to those who hate boring windows. Although, windows are supposed to be boring. It's what you see outside...eh forget it, I'm spending too much time thinking deep about windows, here. Moving on. Not bad for $1.27. Pretty impressive. 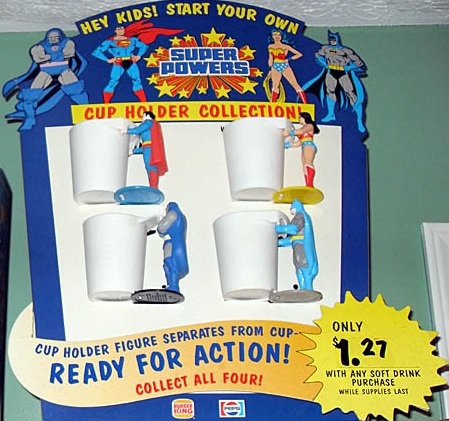 You get a cheap cup and a neat Super Friends figure! Sounds like a great deal to me! Darkseid has always been my favorite DCU villain, so again, total victory here. Anything with the bad boy of Apokolips is an instant buy. Well, duh. This shouldn't be a shock. I saw some tapes that I had never even heard of before, which is always the goal! Some kid friendly horror, a Christmas Babysitter's Club movie(I'm such a sucker for terrible Christmas specials) a documentary narrated by Orson Welles about Nostradamus, an 80s comedy called " Another Chance" and some fun wrestling finds. If you were to ask me to summarize my life in VHS, this would be the photo I'd point to. I don't know if that's good or bad but it's pretty much me in a nutshell. 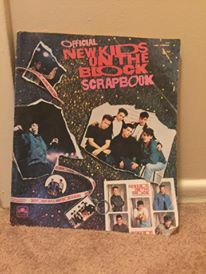 How about that New Kids on the Block scrapbook? That's pretty cool. 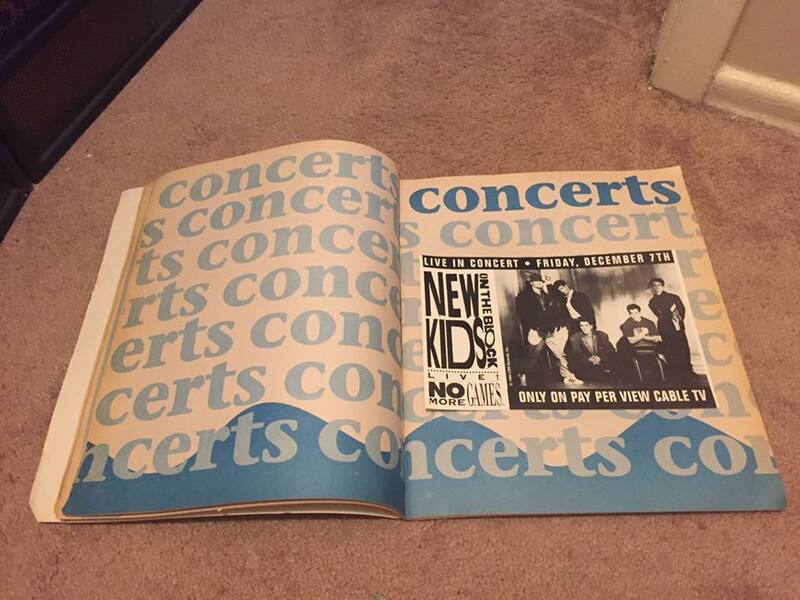 Something for any fan to put her favorite pieces of NKOTB memorabilia and photos. I mean, if you were like me as a teen, you were so unorganized and just put clippings and photos all over your wall. I feel like my entire wall was just plastered with Shirley Manson to the point that my wall may as well have been orange. No regrets. 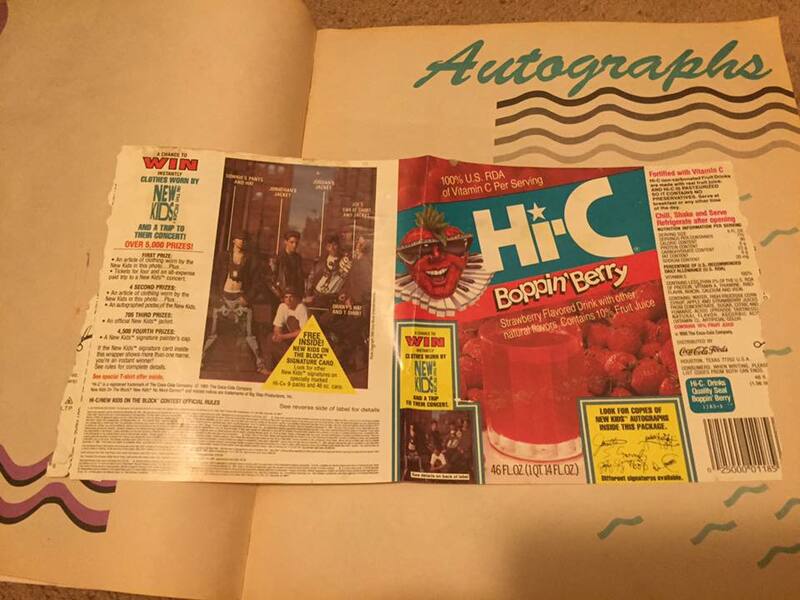 A NKOTB HI-C BOPPIN' BERRY LABEL. 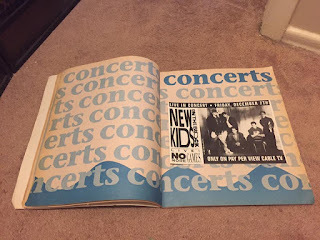 Of all the things to find in a NKOTB scrapbook, I find THIS. I swear as it fell out, a light shined and the "Hallelujah" started playing as I locked eyes on it. Stuff like this doesn't happen often. It probably happens once in a lifetime. And I'm glad I was the lucky recipient. 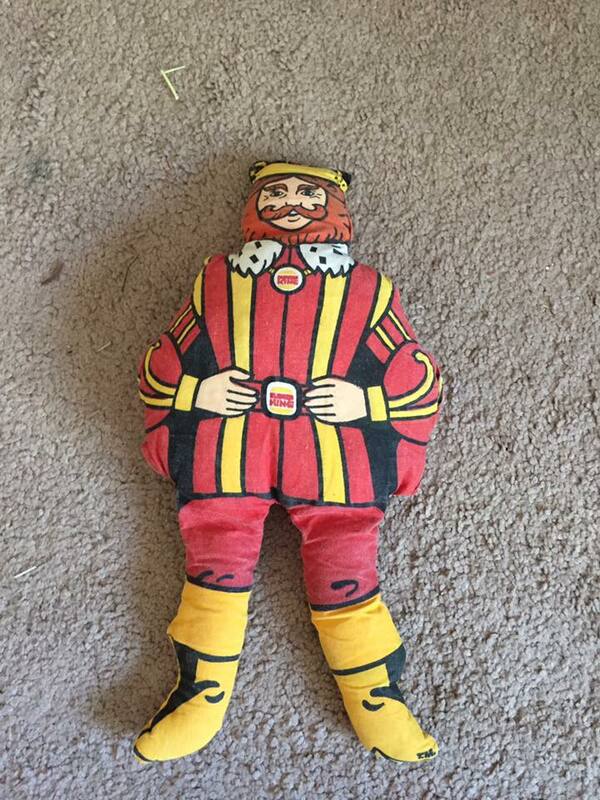 This is definitely the find of a century. How can I follow this up? I mean...CAN I? Oh I'll find a way. Believe me. So thar she blows. Not sure if this is my last flea market trip for the entire year, but it certainly turned out to be the most successful! Very happy with the way things turned out. I guess it was worth the dry spell.